Tip: To see the image in full width, click the title of this post to lose the sidebar. A bit of a change of direction this week; I recently started something which I hope will become a coherent series of photos journaling the real Frome town. I want to include the people and the places that get less of a look-in, which are often ignored for not being pretty enough, retro enough or chic enough for our attention. Like Standerwick, I want this series to inform the viewer without pushing an agenda. You see the pictures, you decide what they mean to you. I don’t want this to be just another series of “petty observations” the like of which you see on Instagram or twitter every day. Certainly Frome gets its share of those with many snaps of Catherine Hill and Cheap Street, or the Independent Market. I’m looking for the slightly grittier side of Frome. 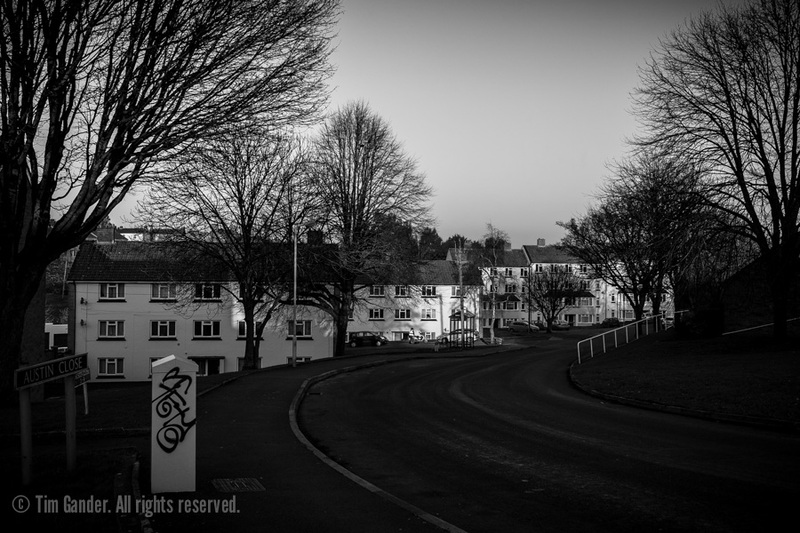 The image below is just the first instalment, a bit of a scene-setter if you like, and it shows The Mount, Keyford, Frome, which is just one of the areas I’ll be chronicling. This series will eventually get its own gallery on my website and perhaps become an exhibition somewhere in the town. Well, that would be super, but we’ll have to see about that.